Fall has definitely arrived – although we were treated to sunny days this weekend, you could definitely feel the chill in the air. So Soup Season is here. I love homemade soups and this one is simple to make and ready to eat in under an hour. I use an immersion blender to finish this soup as I like small bits of the vegetables still in tact, and an immersion blender offers you more control on how smooth, or how chunky you want your soup, as opposed to a food processor. Me, I like it a smidge chunky! 1. Top a cookie sheet with a Silpat sheet liner. Drop spoonfuls (use a tablespoon) on to the liner into little mounds, then press them flat. Bake in 400 degree oven between 5 and 8 minutes (depending upon your oven). Once cooked remove from liner and serve with the soup. I make these while the soup is simmering. 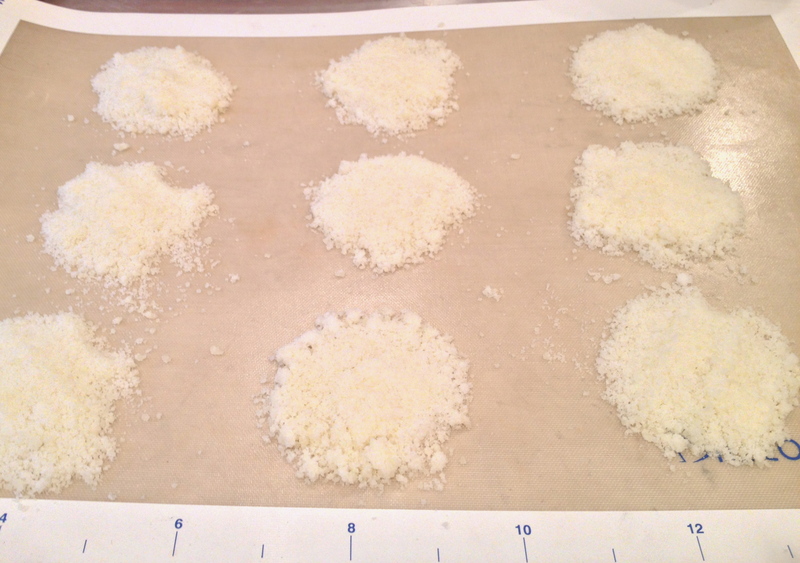 1/2 cup grated cheese makes 9 to 12 crisps. 1. In heavy saucepan melt butter, and add the chopped onion and garlic. Stir till onion is translucent. 2. Wash vegetables and pat dry. 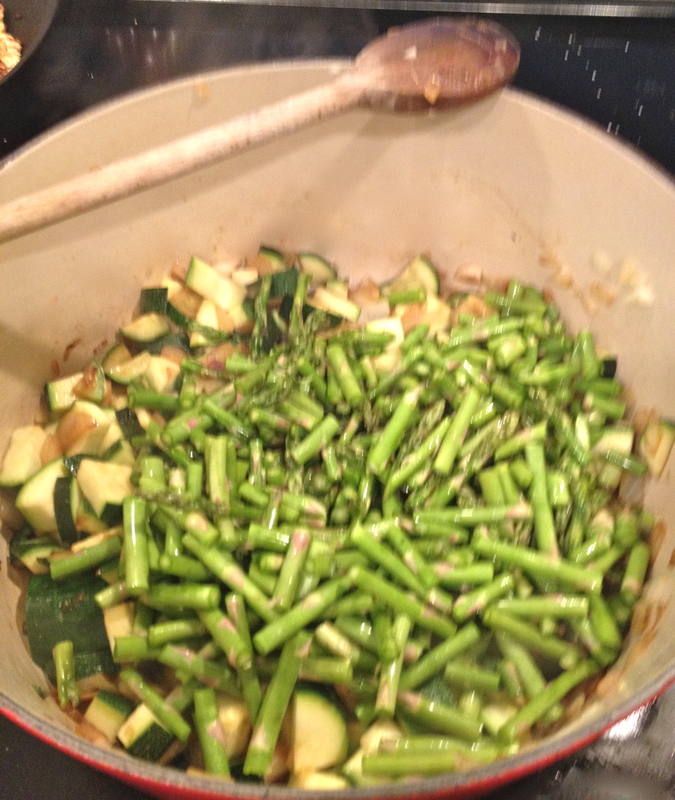 Quick chop the zucchini into small chunks and add to pot. Cut off bottom of asparagus stocks (the woody section), and then rough chop the asparagus and add to pot. Cook for about 5 minutes till the veggies get some brown on them, stirring the entire time. 3. Once veggies are brown, add the chicken broth and bring the soup to a boil, then turn down heat. cover the pot, and simmer for about 20 minutes. 4. Vegetables should be soft but still keep their green color. Test the vegetables by pressing them against the side of the pan with a wooden spoon. The vegetables are cooked when they smash against the side but still hold their shape. 5. Take the soup off the stove and using an immersion blender, blend all ingredients till it starts to thicken. I like the immersion blender over a food processor as the clean-up is much easier and I don’t make a big mess on my side counter, as I do when I use the food processor. 6. Just before serving add the sherry, mix well and pour into soup bowls. 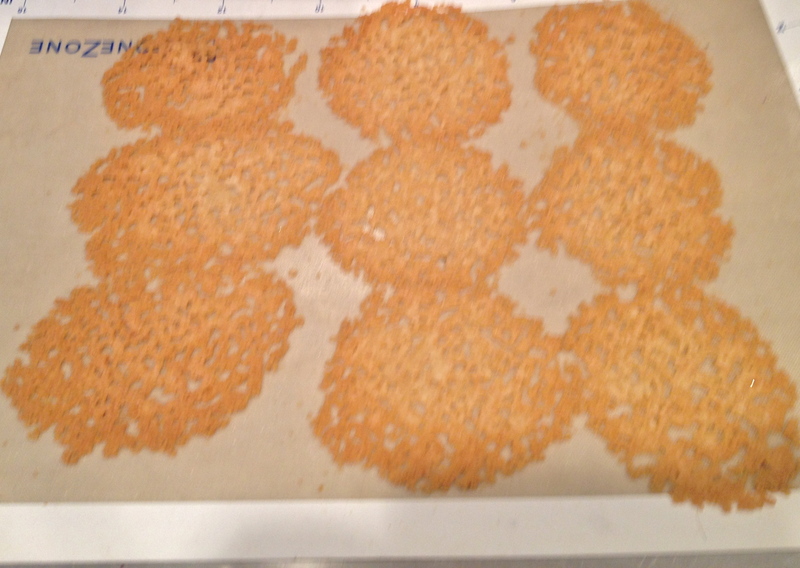 Add a bit of heavy cream to top, and affix one parmesan crisp in center and serve a couple on the side. Love that your soup combines both zucchini and asparagus. I bet it’s very flavorful. Thanks for sharing, Claire. Thanks John. Yes, I think blending the two vegetables gave more meaning and texture to the soup! Your soup cups are beautiful, but those Parmesan crisps take this lovely to to another level. 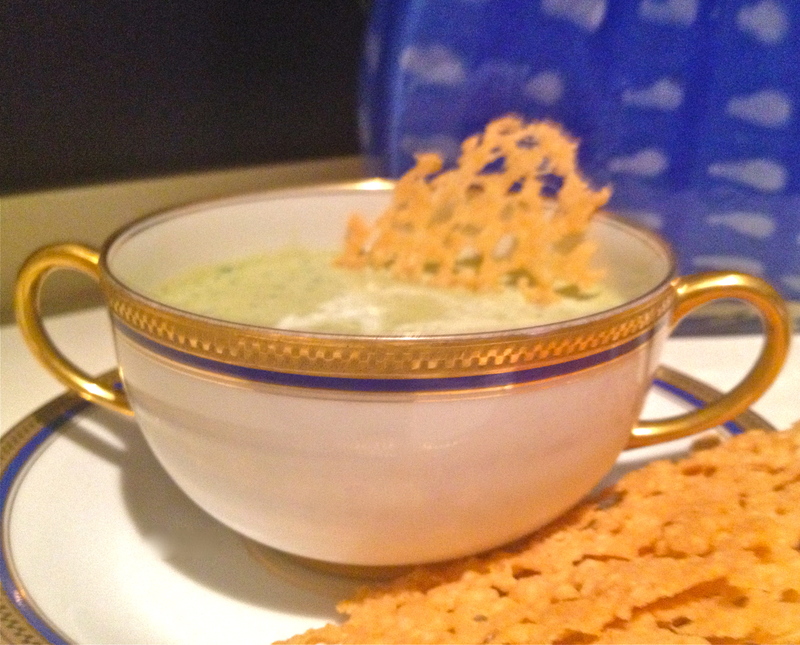 Thanks Eva – the Parmesan Crisps go so well with this soup – they add a little brightness in flavor as an accompaniment. oh oh oh! Love this soup 🙂 My mom always made pureed zucchini soup when I was little, which I despised. Fast-forward to now and I make it every summer. Huge fan of pureed veg soup, and Eva is right–those cheese crisps rock! Thanks Liz! The cheese crisps are quite tasty and a no brainer to make. Better than croutons any day! Pingback: Why isn't your website on the first page of Google?